← Could the Global Positioning System Fail? 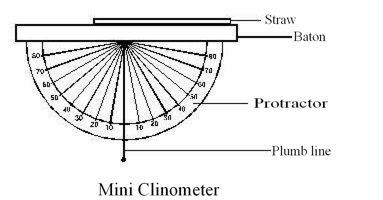 A clinometer is a simple device that can be used to measure the altitude of an object. Despite its simplicity, a clinometer provides a level of accuracy sufficient to measure angles to the nearest degree. A ‘mini-clinometer’ as shown below, can be constructed very easily and cheaply and is small enough to stow in a ruck sack or boat emergency ‘grab bag’. For more information click here. Short wooden or plastic baton (approx. 40 cm in length). Small weight such as a fishing-line weight. Strong glue (suitable for sticking wood to plastic). A piece of smoked glass (see note 3 under ‘Method of Use’ below). Suggested Method of construction (see diagram). Glue baton onto protractor as shown in the diagram. (Note. If you are unable to find a protractor that is marked in the same way as the one in the diagram, simply change the numbers with an indelible pen). Glue drinking straw to top of baton as shown in the diagram. Make a plumb-line from the string and weight and attach to protractor as shown in the diagram. Holding the instrument by the baton, sight the target object through the drinking straw (rather like a telescopic rifle-sight). Hold the device as steady as possible and ask a partner to read off and record the angle indicated by the plumb-line. This will be the angle of elevation of the object above the horizon. If you are alone, simply clamp the string against the side of the protractor with a spare finger as soon as you are lined up with the object and then read off the angle indicated by afterwards. If available, a piece of smoked glass should be used when measuring the altitude of the Sun to avoid damaging your eyesight. This would obviously be difficult for a single person but if you are in company, ask a colleague to hold the smoked glass in front of the Sun for you. (If a piece of manufactured smoked glass cannot be obtained, simply hold a piece of glass in the smoke of a candle or oil lamp until it is covered in a layer of smoke residue). This entry was posted in Schools, Survival and tagged astro navigation, celestial navigation, navigation, survival, survival - astro navigation, survival - navigation. Bookmark the permalink.